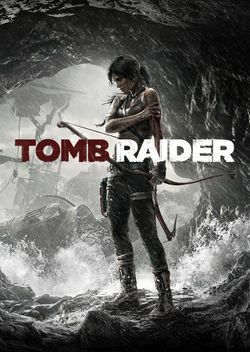 Tomb Raider (2013), which is officially just called TOMB RAIDER, subtitled A Survivor is Born, is the 9th title in the Tomb Raider Series (not counting Anniversary). The game is a reboot and does not carry on the storylines established in previous Tomb Raider games. Further Lara Croft's background story will be slightly rewritten to make it more consistent. The game includes a Multiplayer mode developed by Eidos Montreal, while the game itself is developed by Crystal Dynamics. The game goes back to the beginnings of Lara Croft and shows her as an inexperienced raider who learns and grows during the adventure awaiting her. Her motivation is not (yet) the same as it was in previous games, as she is thrown into the situation involuntarily. In the words of Crystal Dynamics' Karl Stewart: "Unlike before, when she used to go in on purpose, now it's all about getting the hell out." Tomb Raider is rated "M" (Mature) for the showing of violence. The game was released on PC, Playstation 3, and Xbox 360 on March 5th 2013. Prior to the official release date though the game was reported available at many local stores. Downloadable content was first available exclusively on Xbox 360 with other systems following at a later date. The reworked Xbox One and PlayStation 4 version called Tomb Raider: Definitive Edition was released in North America on January, 29th 2014 and in Europe on January, 31st 2014. A port to the open source Operating System Linux was announced by Feral Interactive in April 2016. It is scheduled for release later that year and will be playable on Debian based SteamOS v2.0 as well as other Linux distributions like Ubuntu. Tomb Raider is available for the Android based Nvidia Shield console (Shield TV) since 8. March 2017. Tomb Raider does not have a demo available for downloading. Karl Stewart from Crystal Dynamics posted on Twitter on 17th of January 2013 that there won't be a demo because they don't want to spoil the story of the game. When a sudden storm destroys her research vessel, a young and inexperienced Lara Croft finds herself stranded on a mysterious and remote island hidden off the shores of Japan. Despite several signs of various inhabitants the island is oddly deserted, and an uneasy feeling settles in as strange sounds emerge from the shadows. With only her determination, inner strength, and resourcefulness to help her, Lara must overcome the challenges of a harsh and unforgiving journey that will take her across a vast island wilderness and deep into the claustrophobic and menacing underground tombs from the island's past. As she struggles to prevail through brutal combat encounters and treacherous exploration, Lara will be pushed to her limits and forced to adapt to her situation in order to survive and escape from the lethal predators that stalk her every move. Lara spends much of her childhood visiting archaeological sites around the globe. She later decides against studying at Cambridge University, picking a low-profile college instead. After finishing her education at the age of 21, Lara joins an expedition on the research vessel Endurance under Captain Conrad Roth, an ex-marine, who is willing to do anything to claim a treasure. When they are scouting the coast of Japan for lost treasures, the ship is caught in a storm and shipwrecks. Lara, stranded on the island Yamatai, is forced to survive on her own. Tomb Raider is the first chapter in the story of Lara Croft. As the game begins, Lara is a young college graduate, eager to find adventure and make her mark on the archaeological world. With her best friend Sam, Lara joins an expedition aboard the research vessel Endurance in search of the lost kingdom of Yamatai. Thought to have existed on an island somewhere off the coast of Japan, Yamatai’s true location has remained a mystery for centuries. Trusting in Lara’s research, Conrad Roth, captain of the Endurance, takes the expedition into a dangerous area of the sea known as the Dragon’s Triangle. Note: For information on the location of these levels, see Tomb Raider (2013) Locations. There are basically two groups of human characters on the island, the Endurance survivors and the scavengers. Samantha Nishimura - A female crewmember of the Endurance and Lara's close friend. Taken hostage by the scavengers early on. Dr. Whitman - A scientist on board the Endurance, strangely fascinated with the scavengers culture. Mathias - A scavenger who pretends to be not one of the group, he takes Sam captive. Vlad - A Russian scavenger who assaults Lara and becomes her first kill. A third group of people on the island are the Stormguard, but if they are still human is doubtful. They are accompanied by Oni, big daemon like soldiers. Pick-up element that's found throughout the island. Used for upgrading weapons and collecting it is occasionally a task that must be completed before the player is able to proceed in the adventure. Occasionally found in Salvage crates, used to build new weapons. Hunt or Be Hunted: Evade, outsmart, track, and kill the mysterious enemies that hunt you as prey. Survival Action: Brutally attack and defend yourself as you fight to survive through visceral one-on-one melee combat. Strategic Weapons: Gain an advantage in combat by finding an array of different melee and ranged weapons including a variety of guns and the hunter's ultimate weapon, the bow. Creative Survival: React and adapt to the island by using only that which you can salvage from the environment like climbing axes, rope, and machetes that can be used to unlock new traversal and combat gameplay options. Free Movement: Scramble up a vertical cliff, sprint and leap across a huge chasm, steer mid-air to land a misdirected jump. There is no right way to traverse, survive, and explore the harsh environment of the island. One Cohesive World: The diverse multi-region island is an open playground alive with creatures, weather, and natural events. Origin Story: This new Tomb Raider concept reboots the franchise by exploring the origins of Lara Croft's transformation into a hardened adventurer as you unravel the story behind the island's mysterious past. The mysterious Scavengers inhabiting the island. Russian speaking scavenger - Some kind of leader of the scavengers. Wolves - Wild wolves roam the island and attack at any chance. Stormguard - The remains of an ancient army protecting the remains of the Sun Queen. Throughout the game Lara can upgrade her gear by using salvage, which can be found on the island. "This outfit dresses Lara up as a classic 1930s adventurer, bomber jacket and all." "This outfit camouflages Lara in a heavy coating of mud, action movie-style." "This outfit makes Lara look like a jungle warfare guerilla." "With the Sure-Shot outfit, Lara wears a competition style archery suit with high boots and forearm guards." "The Mountaineer outfit features the padded vest, grapples, and harness of an expert climber." "Outfit Lara with the Demolition gear, featuring an engineering jumpsuit and belt pack." These outfits are already included in the Definitive Edition. Camilla Luddington is the motion capture and voice actress for Lara and Rhianna Pratchett the main writer of the project. Two mayor trailers have been released for Tomb Raider. Additionally a web series called The Final Hours of Tomb Raider has been released to promote the new game. It mainly consists of interviews with the staff of Crystal Dynamics and contains interesting background information. Tomb Raider sold 3,4 million copies in four weeks, but it failed to hit the expectations made for its sales. Square Enix thought that the game could double its 3,4 million first month sales, selling at least 5-6 million units. We put considerable amount of effort in polishing and perfecting the game content for these titles, receiving extremely high Metacritic scores. However, we were very disappointed to see that the high scores did not translate to actual sales performance, which is where we see the substantial variance in operation profit/loss against the forecast. It's been the biggest week one sales in franchise history, and we're only a few weeks into that launch right now, and it's been the biggest opening so far in 2013. So, we're happy with the outcome. It's certainly in a place where we feel like we're on the road to achieving everything we wanted to. ↑ IGN.com: Tomb Raider Won't Get a Demo or Season Pass Originally published on Jan 18th 2013. Retrieved on Aug 13th 2013. ↑ http://cdn.akamai.steamstatic.com/steam/apps/203160/manuals/TRpcMANOLeUS.pdf?t=1410900699 TOMB RAIDER Instructions Booklet via Steam, PC version, page 2. Retrieved on Jan 1st 2015. ↑ Game Informer's review on Tomb Raider Retrieved on July 14th 2013. ↑ Tomb Raider on Gamerankings.com Retrieved on July 14th 2013. ↑ Tomb Raider on PC on Metacritic Retrieved on July 14th 2013. ↑ Tomb Raider on Xbox 360 on Metacritic Retrieved on July 14th 2013. ↑ Tomb Raider PlayStation 3 on Metacritic Retrieved on July 14th 2013. ↑ Eurogamer.net: Tomb Raider has sold 3.4 million copies, failed to hit expectations Originally published on Mar 26th 2013. Retrieved on Aug 2nd 2013. ↑ Eurogamer.net:Square Enix thought Tomb Raider could sell nearly double its 3.4 million first month sales Originally published on Apr 9th 2013. Retirieved on Aug 2nd 2013. ↑ Outline of Briefing Session of Revisions to Consolidated Results Forecasts by SQUARE ENIX HOLDINGS held on March 26, 2013 Pdf-file. Retrieved on Aug 2nd 2013. ↑ Joystiq.com: Crystal Dynamics: Tomb Raider had best week one sales in franchise history Originally published on Mar 29th 2013. Retrieved on Aug 2nd 2013. This page was last modified on 30 April 2018, at 11:33.